'Ms. 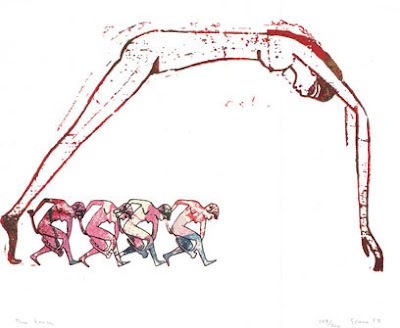 Spero was active in the Art Workers Coalition, and in 1969 she joined the splinter group Women Artists in Revolution (WAR), which organized protests against sexist and racist policies in New York City museums. In 1972, she was a founding member of A.I.R. Gallery, the all-women cooperative, originally in SoHo, now in the Dumbo section of Brooklyn. And in the mid-1970s she resolved to focus her art exclusively on images of women, as participants in history and as symbols in art, literature and myth. 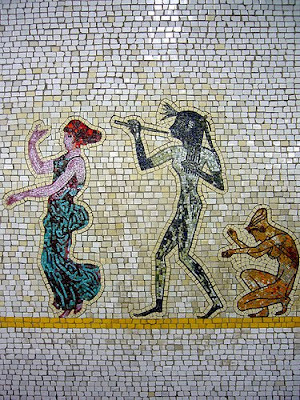 Images: top - 'The Dance' by Nancy Spero; bottom - 'Artemis, Acrobats, Divas and Dancers' by Nancy Spero, mosaic on 66th Street/Lincoln Center Subway Station, New York City (1999, installed 2004).